The second video of the sixteenth module is now available, where we will continue showing how to work with gvSIG Online. As we talked about in the previous video, gvSIG Online is an integral solution on free software for the spatial information management of an organization following the Spatial Data Infrastructures (SDI) model. In the first video of this module we watched how to connect with gvSIG Desktop, being able to do an advanced editing directly in the desktop application and publishing that information in gvSIG Online. In this second video we will see the editing tools that are available in gvSIG Online, a more basic editing for field work, with our mobile device, since we can edit directly on the web. We will also see how to create hyperlinks in gvSIG Online, a very useful feature that will allow us to link the documents related to the town planning regulations of a municipality among other documents. It will allow the citizen to get that information without having to go to the city hall. 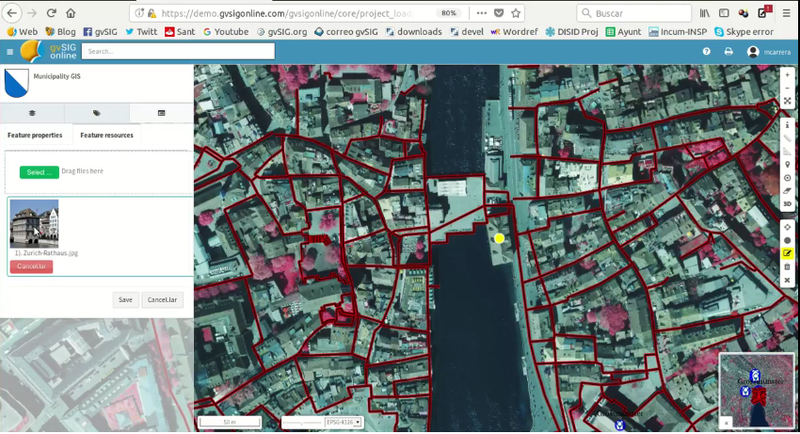 The citizen would look for his parcel on the gvSIG Online project, and using the information tool he/she would get the PDF file with all the information. Like the previous module, you can’t perform this exercise directly, since it is necessary to implement the platform, but you can see everything that can be done with gvSIG Online. This entry was posted in english, geoportal, gvSIG Online, SDI, SDI, training and tagged city council, geoportal, gvSIG Online, municipality management, SDI, Viewer. Bookmark the permalink.